Weeks after CurrentC was delayed (again) and half the team was laid off, the mobile payment that was supposed to serve as a merchant-backed alternative to payment systems from Apple and Android may be over for good. Or at least that’s the impression one might get from an email sent to testers of the system. 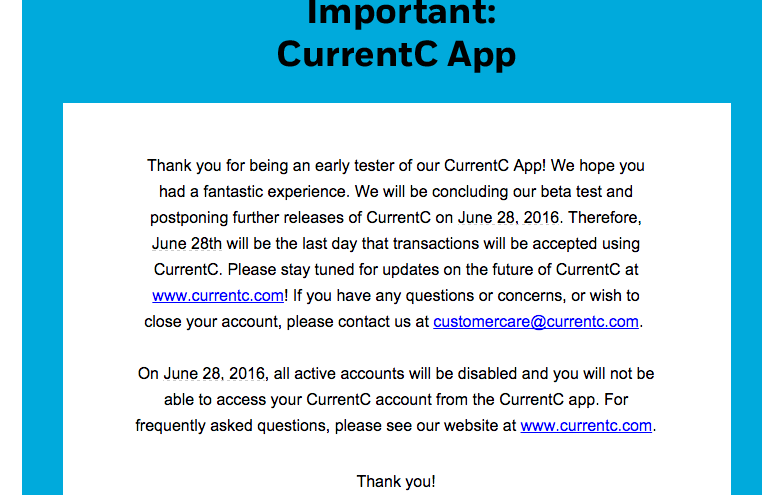 In an email titled “An Important Message from CurrentC,” the mobile payment system told early testers of its app that starting June 28 the company would end its beta test in Columbus, OH. A similar message is now posted on the CurrentC website, along with an FAQ form with information about current users’ options. While the company leaves the door open for future tests and use of the system, it notes that all active accounts will be disabled and users will no longer be able access their accounts from the app once the tests conclude. In mid-May, MCX announced that it would concentrate more heavily in the immediate term on other aspects of its business including working with financial institutions, like Chase, to enable and scale mobile payment solutions. “As part of this transition, MCX will postpone a nationwide rollout of its CurrentC application,” the company said at the time. CurrentC seemed like a great idea to retailers in the Merchant Customer Exchange (MCX) consortium back in 2014. Stores that signed up initially included Walmart, Best Buy, CVS, and Rite Aid. The service required members to not use competing mobile payment systems for a period after signing up, but the “competing” thing became questionable as the launch date for CurrentC kept getting pushed back. The service also suffered a hack before it ever really got off the ground. Many original CurrentC members, like Best Buy, now accept mobile payments in at least some stores. Walmart was the largest consortium member, and has developed its own payment app that’s rather similar to CurrentC. Next Are Mobile Phone Apps To Play State Lotteries Actually Legal? Next Up: Are Mobile Phone Apps To Play State Lotteries Actually Legal?